Decisions, decisions: when purchasing a projector, there are myriad choices one can make. Should I buy an LCD projector? How about a DLP projector? Maybe a short-throw? What brightness do I need? Start here to learn about some of these options. GENERAL-PURPOSE: Dukane’s model 8755J ($795) features 16-watt audio and a lamp life of up to 6,000 hours (when using the company’s “whisper” mode). It is a 2,200-lumen device featuring XGA resolution, inputs for component, S-Video, composite and RGB signals and digital keystone correction. 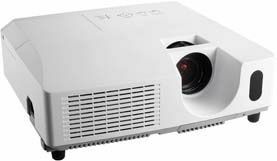 SHORT-THROW: The 8763A ($1,595) is a moderate short-throw projector (throw ratio 1.0 to 1.2) used for schools. The 2,500- lumen projector offers XGA resolution, a lamp life of up to 3,000 hours and inputs for S-Video, composite, DVI and RGB. HIGH-DEFINITION: The 8303W ($1,345) high-definition (WXGA format) projector offers 2,500 lumens, a lamp life of up to 4,000 hours and inputs for S-Video, composite, RGB and DVI. GENERAL-PURPOSE: Canon’s new LV-8300 ($1,099) LCD Multimedia Projector provides 3,000 lumens, WXGA native resolution and an aspect ratio of 16:10, which allows it to support data and images from wide-screen notebooks and desktop computers in WXGA-resolution computers in their native format, making compression distortion unnecessary. Its lamp life is up to 4,000 hours. SHORT-THROW: The LV-8300 projects an 80-inch image from 7.5 feet. HIGH-DEFINITION: Canon’s three new LV-Series projectors also support Blu-ray and DVD players; the DVI-I interface ensures a digital connection that supports HDCP and high-definition content. (HD signals supported include 1,080i and 720p.) The LV-7375 ($1,499) offers 3,500 lumens and a lamp life of up to 4,000 hours. GENERAL-PURPOSE: Dell’s 1409X ($749) is a 2,500-lumen DLP projector; with up to 4,000 hours of lamp life, it provides 1,024x768 XGA resolution and has HDCP, component, composite, S-Video, RS232 and audio input/output ports. INEXPENSIVE: The Dell 1209S lists for $549; for that price you get a DLP projector with 2,500 lumens, 800x600 SVGA resolution, up to 4,000 hours of lamp life and HDCP, component via VGA, composite video, S-Video, RS232 and audio I/O ports. POCKET: The M109S ($499) weighs less than a pound; it is a DLP projector with 858x600 SVGA native resolution and 50 lumens of brightness. It measures about 4”x4”x2” and offers connectivity to laptops, desktops, DVD players and gaming consoles. Its lamp life is up to 10,000 hours. HIGH-DEFINITION: Dell recommends its 7609WU for HD use. This $4,999 projector offers 1,920x1,200 WUXGA native resolution, 3,850 lumens, up to 2,500 hours of lamp life and dual HDMI ports. GENERAL-PURPOSE: Epson recommends its new model 826W ($999) as a general-purpose projector suitable for classroom use. It offers an extended lamp life of up to 6,000 hours, 2,500 lumens, a built-in closed-captioning decoder, an internal 10-watt speaker, network connectivity for remote presentations (via wired LAN) and optional wireless connectivity. INEXPENSIVE: Epson’s SVGA PowerLite S6, selling for $549, offers 2,200 lumens, plug-and-play USB connectivity (in addition to composite, S-Video and VGA) and a lamp life of up to 4,000 hours. HIGH-DEFINITION: Epson’s 4,000-lumen model G5000 ($2,499) supports the 1,080i HDTV input signal; its lamp life varies from 2,000 (high-brightness mode) to 3,000 hours (low-brightness mode). GENERAL-PURPOSE: The Christie LX500 ($6,495) is a 5,000-lumen XGA (1,024x768) projector with a choice of four optional lenses, motorized lens shift and focus and a 3,000-hour lamp life. SHORT-THROW: The Christie LW400 ($5,495), with the optional 0.8:1 fixed short lens, can project a five-foot image from four feet away. It is a WXGA (1,280x800), 4,000-lumen projector with a lamp life of up to 3,000 hours in eco mode. HIGH-DEFINITION: The Christie HD405 ($24,495) is a 4,100-lumen DLP projector with native 1,080p HD (1,920x1,080) resolution. It offers a range of six optional lenses with vertical and horizontal lens shift. It accepts inputs of VGA through UXGA (1,600x1,200) and supports standard HDTV formats of up to 1,080i. GENERAL-PURPOSE: Hitachi’s CP-WX410 ($1,499) is a 3,000-lumen, WXGA LCD projector with a 2,000- to 3,000-hour lamp life (regular versus whisper mode); its inputs include S-Video, composite, component and RGB. It has a 10-watt audio output. SHORT-THROW: The company’s CP-A100 ($2,495) extremely short-throw projector creates a 60-inch image from only 1.6 feet. It offers a brightness of 2,500 lumens, XGA resolution and S-Video, composite and component inputs. INEXPENSIVE: The CPX5 sells for between $600 and $650; it offers 2,500 lumens, XGA resolution and a lamp life of 2,000 to 3,000 hours. HIGH-DEFINITION: The high-end CP-SX635 (street price, about $4,000) has 4,000 lumens, 16-watt audio, HDMI input for high definition and a lamp life of 2,000 to 3,000 hours. GENERAL-PURPOSE: Mitsubishi’s new XD221U (street price, $700 at www.bhphotovideo.com), a 2,300-lumen DLP projector, has a 10-watt speaker and audio-mix capability (the projector can simultaneously project audio from two sources, such as a DVD and a third-party wireless microphone). It offers XGA native resolution and a lamp life rated at 4,000 hours in low mode. SHORT-THROW: The XD500U-ST (list price, $1,995; street price, around $1,300) projects a 60-inch image at a distance of only 33 inches, or a 100-inch image at a distance of 55 inches. It is an XGA, 2,000-lumen projector with a lamp life of up to 3,000 hours. POCKET: Mitsubishi’s XD95U (list price, $1,995; street price, about $1,000) is not quite “pocket,” but it is a DLP microportable XGA projector weighing three pounds and offering 2,200 lumens. Its lamp life is up to 3,000 hours. HIGH-DEFINITION: The Mitsubishi HC5500 (list price, $4,995; street price, about $2,300) LCD projector projects at a full HD (1,920x1,080) 1,080p resolution. Brightness is rated at 1,200 lumens and lamp life at 5,000 hours in low mode. GENERAL-PURPOSE: The NEC NP400 (list price, $1,199; street price, about $800) LCD projector provides bright images (2,500 lumens) and wired network connectivity to users who require remote monitoring and control at a value price. It includes built-in closed captioning, seven-watt audio, automatic keystoning and eco mode technology, which can boost lamp life to 4,000 hours. SHORT-THROW: The NP600S ($1,199) creates a 77-inch diagonal image from less than four feet; it is a 2,600-lumen projector and, like the NP400, has wired network connectivity and provides up to 4,000 hours of lamp life in eco mode. INEXPENSIVE: The NP200 is a DLP projector with a street price of about $600; it is an XGA resolution projector and has 2,100 lumens and a lamp life of 3,500 to 4,000 hours. Its inputs include composite video, dual component/VGA and S-Video. HIGH-DEFINITION: NEC recommends its NP500W ($1,399) for high-definition projection; with 3,000 lumens, it supports the 1,080i high-definition video mode. GENERAL-PURPOSE: The Optoma EP1691 ($760) is a 2,500-lumen WXGA DLP projector with a lamp life of up to 3,000 hours and HDMI, VGA-In, S-Video and composite capability. SHORT-THROW: Optoma’s short-throw (a 100-inch image at four feet) EX525ST ($1,099) features many connectivity options and XGA resolution, making it appropriate for a variety of environments, such as classrooms and conference rooms. This DLP projector features BrilliantColor technology for high-quality image clarity. Its lamp life is up to 4,000 hours. POCKET: Optoma’s PK-101 Pico Handheld Projector ($399) weighs four ounces and measures 2’x4”, which means it is a true pocket projector. It can project from as little as eight inches from your screen; from eight feet the image is 65 inches. A word of caution, though: the PK-101 does not connect to notebook computers, PCs or other devices unless the device has composite output. Please make sure to consult your device’s owner’s manual. It does connect to devices such as DVD players, VCRs, game consoles, digital cameras, camcorders and iPods (it includes an iPod kit with dock connector). Optoma claims a lamp life of 20,000 (yes, thousand) hours. GENERAL-PURPOSE: The InFocus IN1102 ($1,199) is a DLP projector offering 2,200 lumens and WXGA 1,280x800 resolution. It connects to a laptop via USB, also accepts S-Video and composite and weighs less than three pounds. Its lamp life is 3,000 to 4,000 hours. INEXPENSIVE: The InFocus IN2102 ($549) is an SVGA (800x600), 2,500-lumen DLP projector with input sources from both composite and S-Video and a lamp life rated at 2,500 to 3,000 hours. HIGH-DEFINITION: The InFocus X10 ($2,299) offers “full HD” via the 1,080p DLP chip set; brightness ranges from 960 to 1,200 lumens, and it accepts input from HDMI, S-Video, component and composite sources. Its lamp life is 2,000 to 2,500 hours. GENERAL-PURPOSE: ViewSonic’s PJD6220 (list price, $1,199; street price, about $900) is a lightweight DLP projector utilizing BrilliantColor technology. Its high brightness and contrast ratios make it suitable for many lighting situations. This projector features closed captioning for the hearingimpaired. SHORT-THROW: ViewSonic PJD5351’s short-throw ratio produces a 50-inch image at a distance of three feet; it weighs just 5.1 pounds. HIGH-DEFINITION: The company’s Precision Pro8100 Home Theater projector delivers full 1,080p HD resolution, and a C2Fine liquid crystal panel and “HQV Hollywood Quality Video” processor produce crisp HD images. GENERAL-PURPOSE: The TLP-X150U ($899) offers 2,600 ANSI lumens and XGA 1,024x768 resolution and weighs only four pounds. It features closed-captioning capabilities, extensive multimedia connectivity and a USB port for “PC-free” presentations. Its lamp life is 2,000 to 3,000 hours (eco mode). SHORT-THROW: Toshiba’s TDP-EW25U ($1,869) is the company’s “extreme-short-throw-projection” projector, which can project an image of up to 100 inches diagonally from just four feet away. It is a 2,600-lumen, WXGA projector with a lamp life of 2,000 to 3,000 hours. INEXPENSIVE: The Toshiba TDP-SP1U ($549) offers 2,000 lumens, SVGA 800x600 resolution and 2,000:1 contrast ratio and weighs just four pounds. Its lamp life is 3,500 to 4,000 hours. POCKET: Toshiba has a new, palm-sized TDP-F10U LED projector that weighs only 1.4 pounds. It is a 100-lumens, 1,000:1 contrast DLP projector that connects to laptops, DVD players and gaming consoles. GENERAL-PURPOSE: The Sharp PG-F255W ($1,495) offers 2,500 lumens, WXGA 1,280x800 native resolution, RJ-45 LAN connectivity and built-in closed captioning. Its lamp life is 2,000 to 4,000 hours. SHORT-THROW: The Sharp PG-F267X ($2,100) short-throw DLP 2,500-lumen projector throws a 100-inch diagonal image that can be projected from a distance of 51.2 inches from the screen. Lamp life is 2,000 to 4,000 hours. HIGH-DEFINITION: The new DLP PG-D3750W ($2,650) projector features 3,700 lumens and a 2,200:1 contrast ratio. It offers Wide XGA (WXGA) resolution (1,280x800). The PG-D3750W includes an HDMI connection, RGB and component inputs, S-video, composite video and stereo audio (five watts per channel). Lamp life is 2,000 to 3,000 hours. GENERAL-PURPOSE: Sanyo’s PLC-XC50 is a 2,600-lumens, XGA LCD projector listing for $1,495 (street price may be lower). It has a lamp life of 3,000 hours, inputs for DVI-I, component, RGB, S-Video and composite signals, and a 7w mono speaker. SHORT-THROW: As far as short-throw projectors go, the Sanyo PLC-XL51 can project an 80”-wide image from about 3 inches. Yes, that’s 3 inches. We’ve not seen a shorter throw. It is a 2,700-lumens XGA LCD projector listing for $3,995. Another Sanyo choice is the PLC-WXE45, which projects an 80”-wide image from approximately 34”; it is a 2,000-lumens, 1,280x800 projector listing for $1,795. INEXPENSIVE: The Sanyo PLC-XW60 is selling for about $549; it is a 2,000-lumens, XGA LCD projector with inputs for component and video signals. It also sports “Power-Off and Go,” enabling the power cord to be disconnected right after a presentation. GENERAL-PURPOSE: Panasonic’s PT-LB75U (list price, $1,999; street price, $1,000) is a 2,600-lumens, XGA-native-resolution projector with a lamp life rated at up to 3,000 hours. Inputs accepted are S-Video and RGB. HIGH-DEFINITION: The Panasonic PT-AE3000U (list price, $3,499; street price, $2,500) high-definition 1,080p projector offers 1,600 lumens with HDMI, computer, component, S-Video and video-in capability. GENERAL-PURPOSE: Sony’s new VPL-TX7 and VPL-TX70 both offer closed-captioning capabilities, an RJ-45 port for network control and monitoring, as well as the ability to schedule e-mail notifications of projector status. A range of I/O includes two RGB inputs and a monitor output with one variable audio out. The TX7 lists for $1,090 and the TX70 for $1,230. While both have a 3,000-hour lamp life, the TX7 is 2,000 lumens, while the TX70 is 2,600. INEXPENSIVE: The VPL-ES7 offers native SVGA (800x600) resolution and light output of 2,000 lumens. It accepts a wide variety of input signals from standard definition (SD) to high definition (HD), including composite video, S-Video and analog RGB/component via the HD D-sub 15-pin. The VPL-ES7 (shipping this month) has a list price of $750, but Sony says it should retail for about $529. Its lamp life ranges from 2,000 to 3,000 hours. HIGH-DEFINITION: Sony offers native HD projectors such as the VPL-FH300L (1,080) and VPL-FW300L, VPL-EW5, VPLCW125 and VPL-FW41 (720P). These range in price from about $1,000 to $40,000.